Tackle challenging terrain in comfort. A progressive design borrows elements from Salomon® trail running shoes and works them into rugged boots built for tough day hikes and backpacking trips over steep, rocky and untamed country. Nubuck leather and synthetic uppers provide comfort and durability. GORE-TEX® waterproof-breathable booties keep rain and puddles out. Rubber heels and toecaps protect your feet from impact and abrasion. Gusseted tongues block out pebbles and trail debris. Shaped Ortholite footbeds offer comfort with each step. 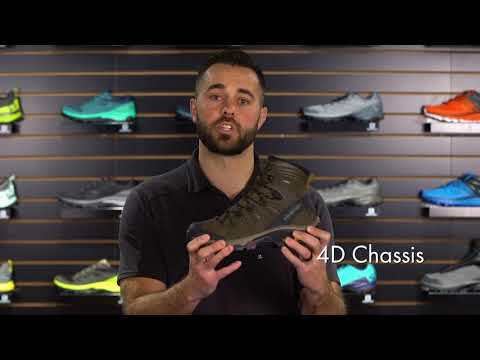 4D Advanced Chassis midsoles create a stable, resilient ride: a layer of EVA provides underfoot cushioning, an under-arch shank adds stability, and a second full-length EVA layer wraps the shank in resilient, high-density foam. High-wear, abrasion-resistant, trekking Contagrip® rubber outsoles give you exceptional grip and durability in rugged terrain.